Launched in 2014, the Swachh Bharat Abhiyan, started with the objective of providing toilets to all to end open defecation. 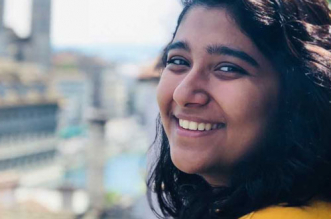 In its third year, the initiative has grown in scope to cover programmes to reduce nation’s overall garbage generation and improve waste management. 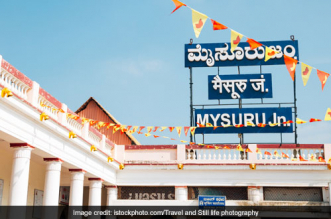 As every state is taking steps to achieve these two goals, a district in Karnataka came up with the most simple and swift solution to end open defecation and reduce plastic waste from simply piling up in landfills. 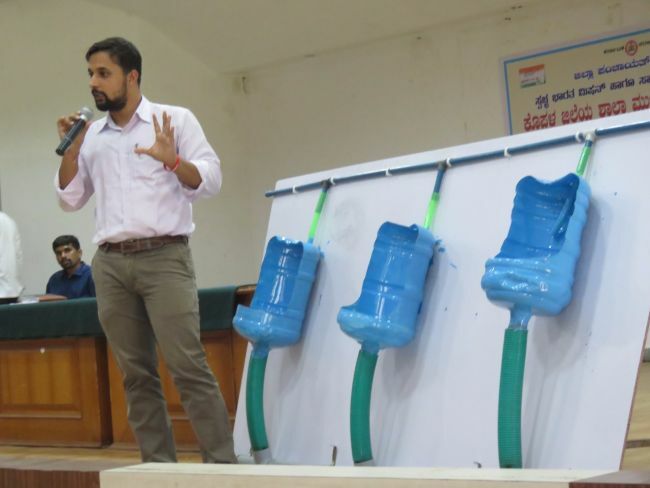 In June this year, local teachers and officials from the Koppal Zilla Parishad came together and installed low cost urinals in more than 1,000 district schools made out of waste water cans. The project of having low cost urinals is the brainchild of the Chief Executive Officer of Koppal Zilla Parishad Venkat Raja who proposed the idea to all the district school authorities after toilets in schools were found to be unhygienic and unclean by the authorities. The unbearable stench and poor condition of the toilets in schools often led to low attendance. Talking to NDTV, Mr Raja says, Since using a urinal is more preferred than toilet, we came up with idea of running the project in district schools. The project serves dual purpose of reusing waste water cans and providing a hygienic place for students to urinate. We have Reverse Osmosis plants in our district and hence a decent number of waster cans are always in circulation which we used to our advantage instead of selling them. Finance was another reason why district officials opted to build urinals out of plastic cans, “Toilets costs upto Rs 15,000, and when we calculated the cost of these plastic urinals it came upto Rs 1,500. 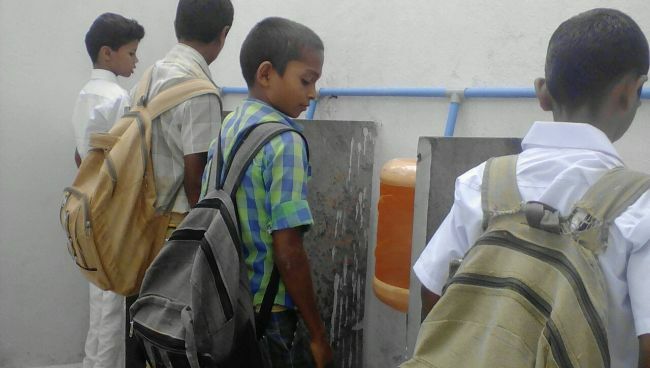 Depending on the usage need, we have installed urinals ranging from 2 to 5 in every school” explains Mr Raja. After circulating notices to the teachers and block development educational officers, a training session of making the urinals was organised where DIY videos were shown. After learning the techniques, the project was implemented. Students of Koppal district were also involved in the process to give a sense of ownership to them. “There is a sense of moral responsibility generated among children if they are directly made a party to the activity. From cutting out cans, painting it to finally giving it a polish, we made students an integral part of our initiative,” says Mr Raja. The project employs a unique ‘Child to Community’ approach, which aims to create a ripple effect and trigger behavourial change among people. “Children will see how beneficial it is to a have system for an individual to relieve in a hygienic manner and will encourage their parents to build a toilet at home,” he adds. Every urinal is connected with a single pit disposal system which is scientific and sustainable. The soak pit has multiple layers of pebbles and stones through which the liquid waste passes and then absorbs in the ground without contaminating the groundwater. 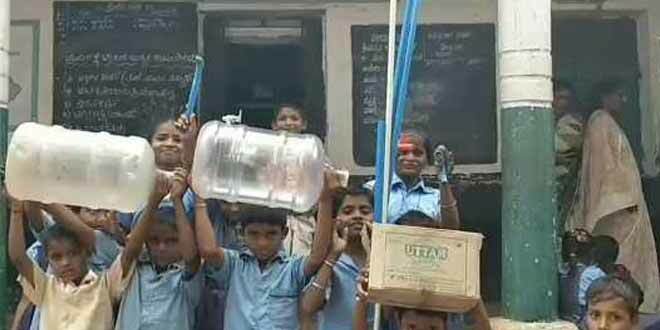 The low cost urinal model has been shortlisted in Swachathon 1.0 by the government, under the category ‘How can we improve Sanitation in Schools’ confirmed Mr Raja. This isn’t the first time that Koppal district has involved children in the Clean India Mission. During the Independence week, the district had formed a human chain of 10,000 people mostly consisting of school children to create awareness about open defecation and cleanliness. Since the start of Swachh Bharat Abhiyan in 2014, 59,565 toilets have been constructed across the district. With a target of constructing around 50,000 toilets in next two months, the district aims to go Open Defecation Free by October 2 this year, confirmed Mr Raja.